The WordUp kids meet every Thursday with a group of mentors/tutors and their team leader, Elese Daniels. 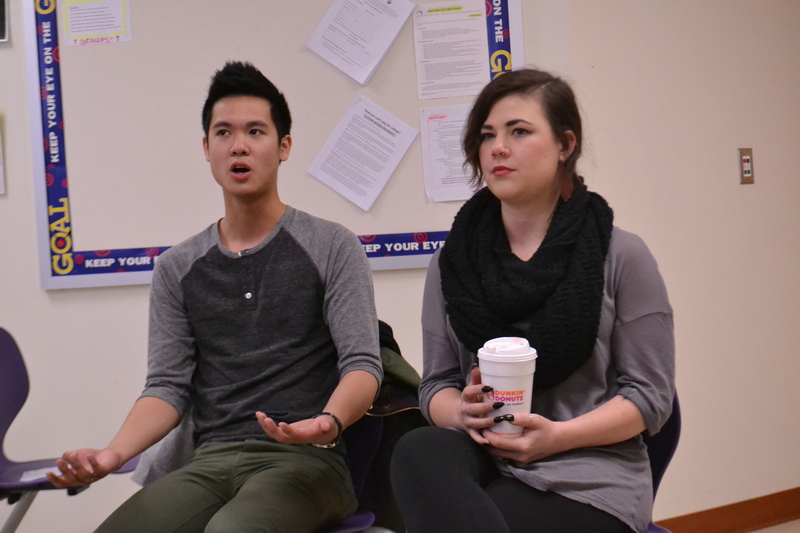 With less than two weeks until the Louder Than A Bomb semi-finals, this past Thursday meeting had a different vibe to it. The kids and the tutors all knew that this was crunch time and you could feel it in the air. 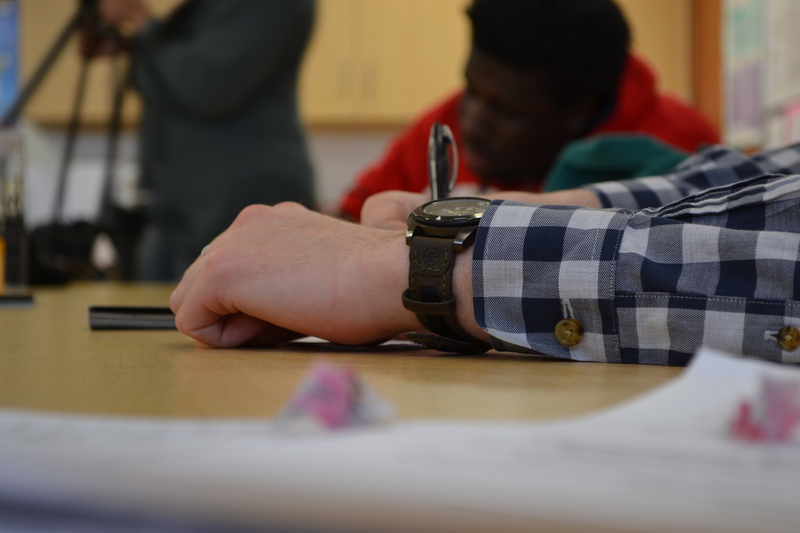 Since November, the students have been learning different techniques and exercises to learn how to write their poems and they’ve had the chance to work on several different pieces. Now, with the competition rapidly approaching, the luxury of time is gone and the kids have started focusing specifically on their performance pieces with the tutors. At this meeting, they worked on their poems for the first hour and then performed for the group to get specific critiques. Now that the students are working on the same pieces week after week, I have finally started to notice a difference in the students writing and performance. 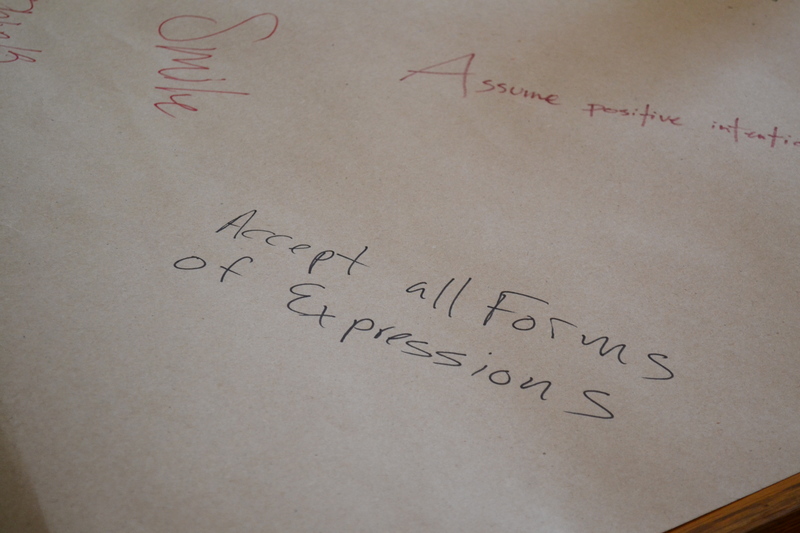 Also, it has been really interesting seeing the wide array of topics for these young poets. As one might expect, there are poems about love. Love obtained. Love lost. Love hoped for. Still, there are also poems about loss, trials, pain, faith, and one fantastic poem that shines a different point of view on a very sensitive subject. One thing that was stressed at the very first meeting was the idea of respect. 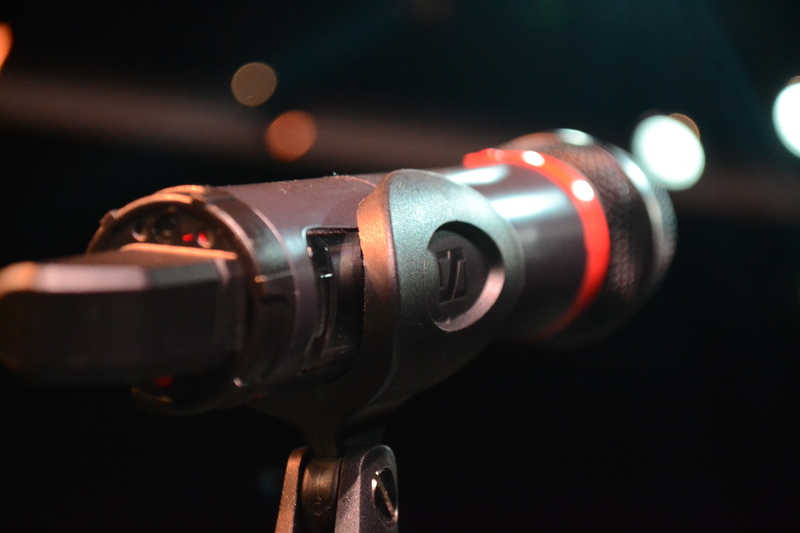 Respect for the speaker and respect for the voice. In all the times I’ve been with these kids, I have never heard one student say anything negative about another students work. 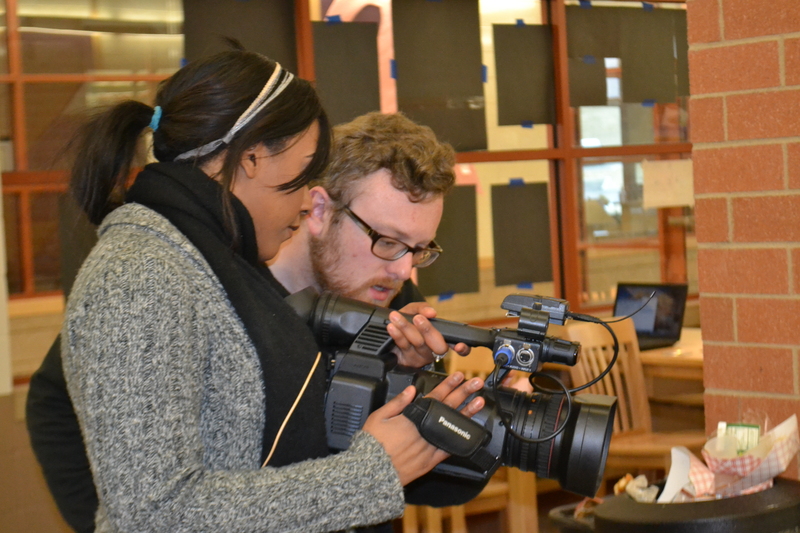 They might have some constructive criticism, but never anything mean which shows that this environment these mentors & tutors have created for these students is a safe place for creativity. 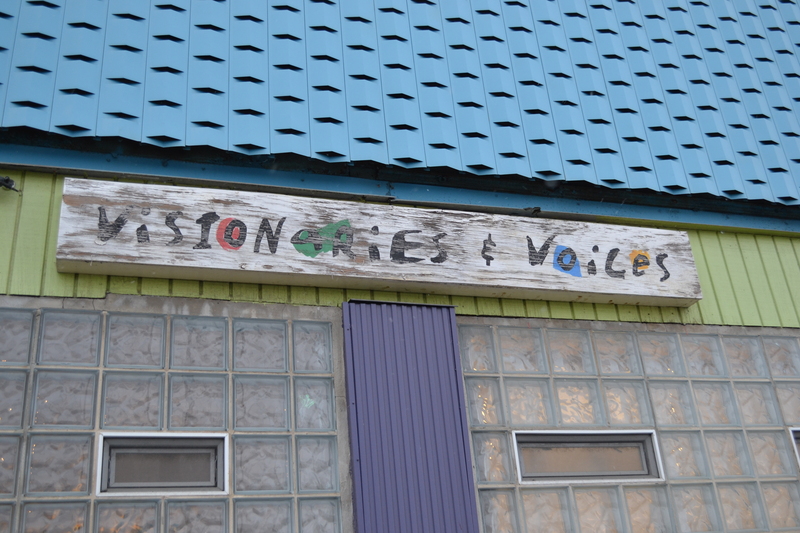 After the students were finished polishing and practicing their pieces, they all crammed into cars to venture out into the cold and across the wilds of Cincinnati to a poetry slam at Visionaries & Voices, an art studio & creative space in Northside. 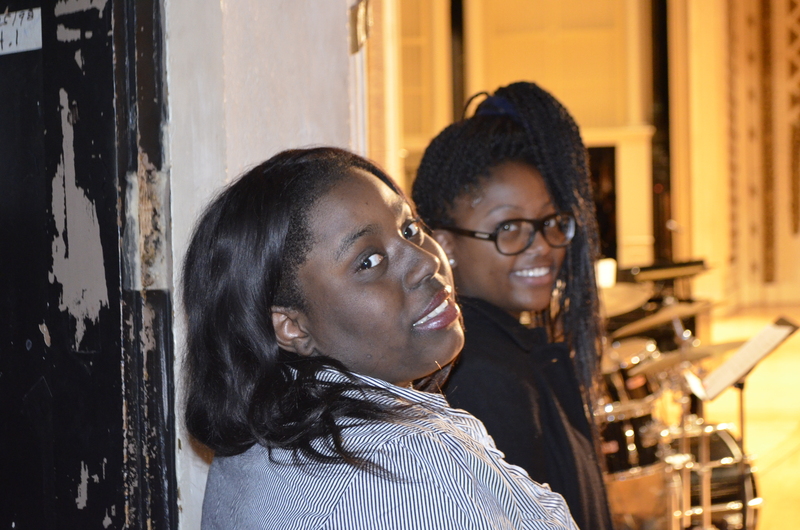 In the past, few of our WordUp kids would attend these monthly poetry slams, but this time was different. Nearly all of the students who attended the after school workshop not only went to the slam, but also participated in it. In fact, the only poets who performed were WordUp kids. That’s a vast improvement from just a month ago and if this is any indication of the progress these next few weeks, than these kids will be more than ready for Louder Than A Bomb! 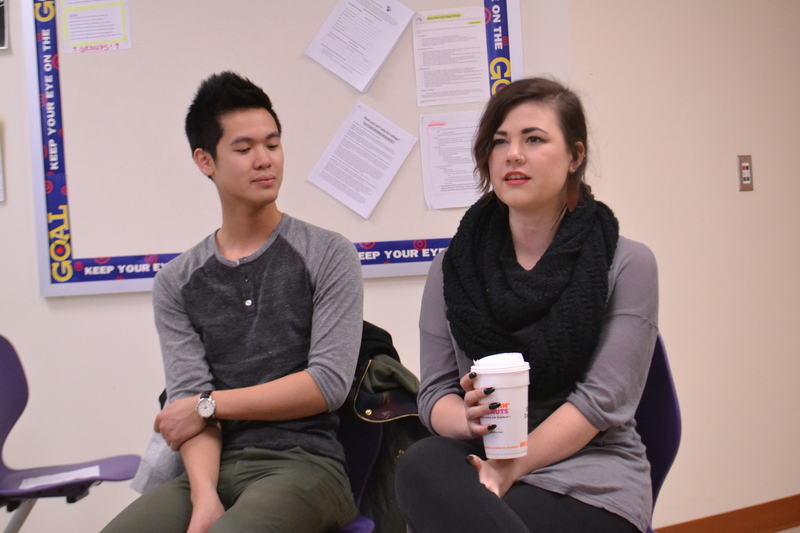 Back before all the snow came to the tri-state, Poets Alex Dang and Clementine von Radics dropped by Aiken HS to visit with our WordUp kids. Dang and Von Radics are both from Portland, Oregon and they are currently driving around the country on a poetry tour. 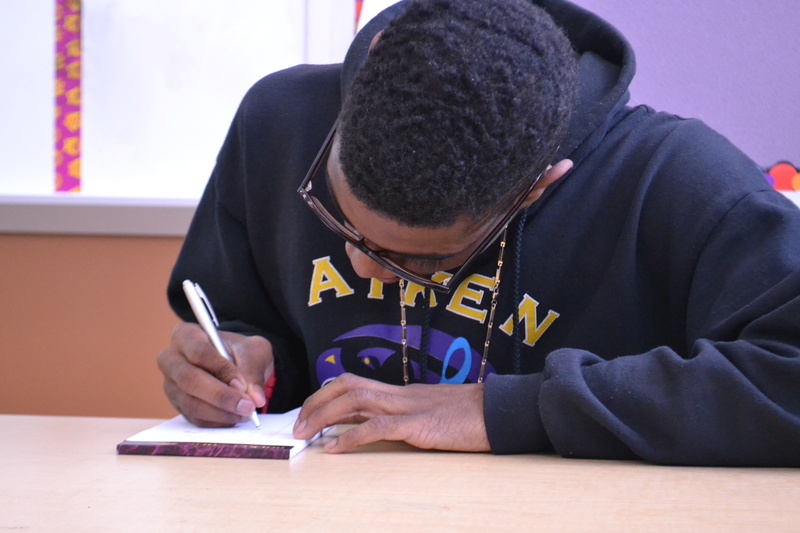 On Feb. 12, they came to Aiken not only share their own poetry, but to also listen to the student’s poems and give them advice before the competition. Some were a little shy, but I did notice some students really took notice and they were excited to perform their pieces, get feedback and to get a little inspiration. The students also had a chance to ask questions. Dang mentioned that he was the youngest in his family with three older brothers and that his family didn’t really understand what he was doing at first but that they are a lot more supportive now. “I want to be the person that I never had when I was younger and I want to be able to inspire other people with my story,” Dang said. Here is an example of their poetry. 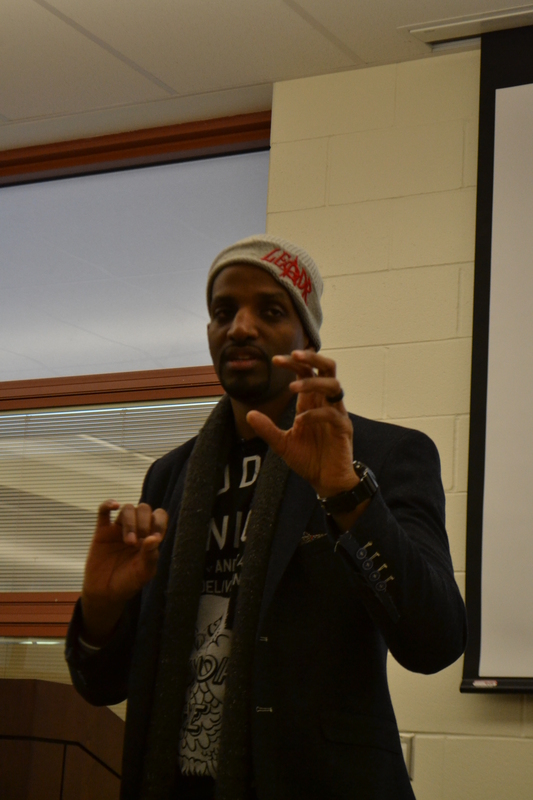 Grammy-winning poet, J.Ivy was on his way to a book signing to promote his book, “Dear Father,” last Thursday and stopped by Aiken New Tech High School to share inspirational words with our WordPlay kids. The kids warmed up the mic with their own poetry and, being joined by the WordPlay group from Seven Hills School, it was nice to see the kids really getting into their poetry. I can start to pick out the different voices in each of the kids work now and that is what this event was really about. 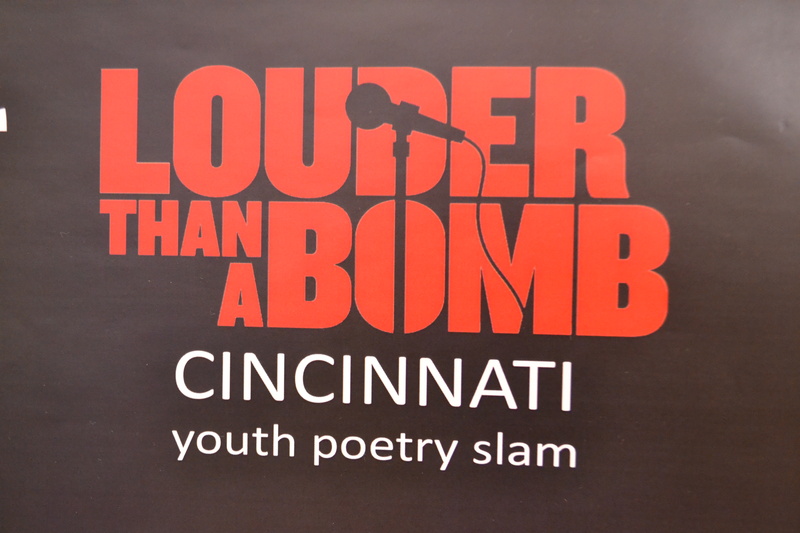 Desirae Hosley, known as “The Silent Poet” and the Louder Than A Bomb (LTAB) coordinator for the Wordplay team, said this event was a chance to show these kids that everyone has something to say. That was another theme for this event…that these kids are not alone. Then when J.Ivy walked in the room, you could feel a shift of excitement. Kids would turn around to get a peek at the artist and then would quickly look away so you could tell they were in awe. Poet J.Ivy speaking to the kids. Looking around the room, I could tell this poem really touched the kids. The words spoke about putting down on paper what a person was feeling and I know from working with these kids that they are very familiar with that process. 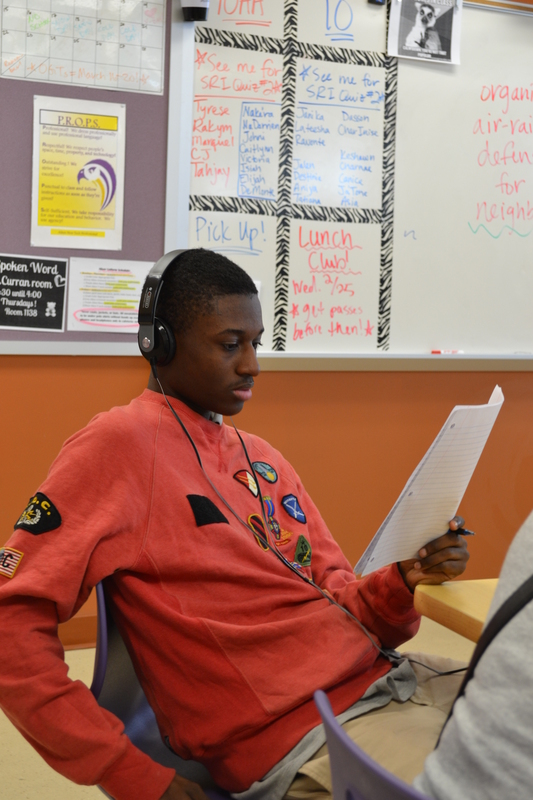 One of the students who hasn’t really shown a lot of interest in these poetry sessions before really got into it while J.Ivy was haring his words and it was nice to finally see that emotion. Taylor & Holland getting ready for the shoot. J.Ivy speaking with the kids. Taking some time to pose with the kids. Even the documentary team wants a picture. Libby Hunter poses with J.Ivy and his new book,. With this past Monday being Martin Luther King Jr. Day, there were several celebrations around the country to celebrate the life and legacy of this great man. 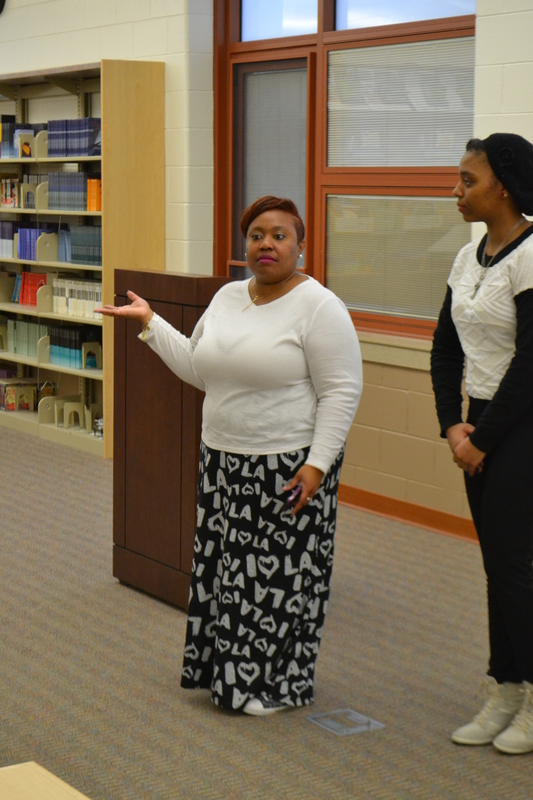 Here in Cincinnati, the Martin Luther King Coalition held an event that was open to the public and two of our WordPlay poets participated by sharing their voices. Tayshona Holliday, 18, is a senior at Aiken New Tech High School and regularly attends WordPlay’s weekly writing program and is a member of the WordUp team for Louder Than A Bomb. Holliday performed an original piece titled, “Finally,” and was very excited to have the opportunity to perform in front of so many people. Tayshona Holliday performing her piece, “Finally” to a crowded Music Hall. She hoped before performing that her words would inspire the audience of all races. “I believe this will open everyone’s eyes…to get them to see that not only are the older people affected, but the younger people, the younger generation are as well,” Holliday said. Libby Hunter, executive director and co-founder of WordPlay, said something similar in a recent interview about WordPlay. Programs and organizations like WordPlay are helping these kids not fall through the cracks and to get the help that they not only need, but that they deserve. Holliday will be attending the University of Cincinnati in the fall as a journalism major where she will continue her writing. Arderia Lankford, 14, is a freshman from Seton High School and is also a member of WordPlay’s Louder Than A Bomb team and a member of Against the Grain Scholars. 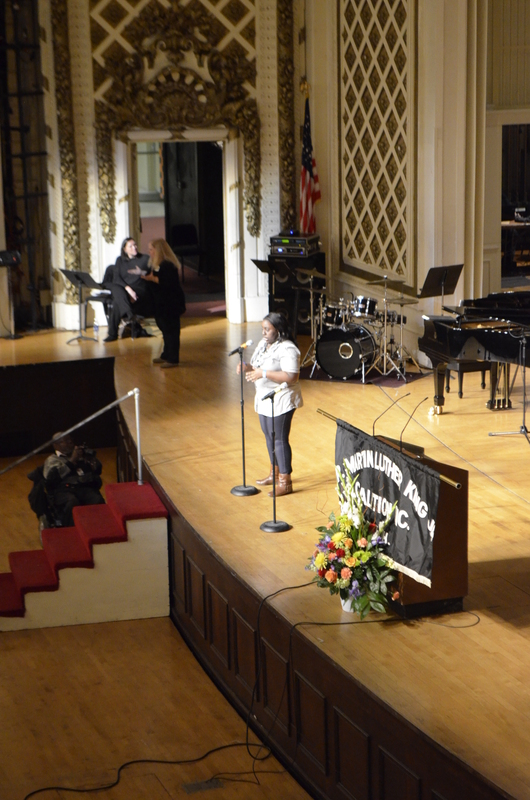 Arderia Lankford performing her piece, “Now pass that on” to the crowd at Music Hall. 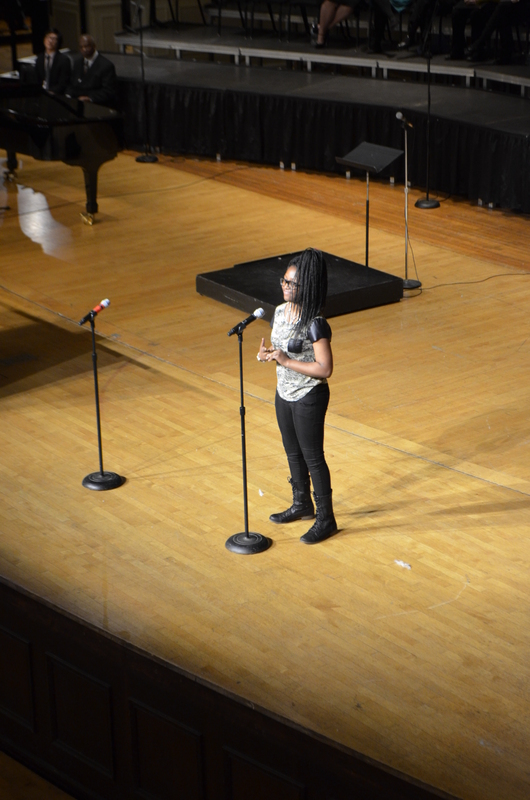 Lankford performed her original piece, “Now pass that on,” and said felt good about performing in front of a large crowd because she’s performed at slams before. She said she hopes her piece will inspire people by saying, “if we’re going to fight, know the way to fight” and that there are a lot of injustice happening around us and things we can fight for. The crowd erupted into applause while the ladies performed their pieces and concluded by giving them a standing ovation as they walked off stage where they were seen literally jumping for joy for what they had just accomplished.